Having strong, healthy bones is important. But strong bones don’t ‘just happen’. Although neither do weak bones ‘just happen’. Bones aren’t like rocks or dead sticks inside your body … even when you’ve stopped growing and have reached adulthood, your bones are still always evolving. Like any cells in your body, as your bones are being used, stressed and broken down by your daily activities, new bone is being built back up. It’s a continuous process throughout your life. However, your bones are very susceptible to being affected by external factors. Poor nutritional habits, drug abuse, smoking, being sedentary, and even every-day prescription or over-the-counter medication use can contribute towards slowly decreasing your bone health, strength and density. If too much bone is being broken down by these kinds of habits, but your body isn’t able to keep up and too little new bone is built back up, weak and brittle bones are the result. Weak, brittle bones can be very easily fractured. 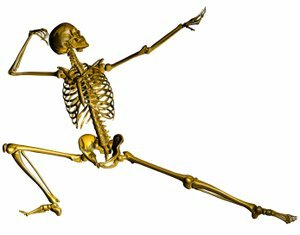 As you can imagine, living with bones that are easy to break can seriously limit your ability to carry out many activities, and severely decrease your enjoyment of your life. Heck, sometimes even something as simple as walking through a crowd can cause a broken rib cage. It’s true! I personally have a friend who found out he had Osteoporosis in the first place this exact way. A random elbow from another person in the crowd hit his ribs softly in passing and broke them. While Osteoporosis does affect mostly women, it’s certainly not just a ‘woman’s disease’. I’ve personally known men who have developed it (the friend I just mentioned is one of them). However, this condition is preventable … and for someone who is already in it’s clutches it is also treatable, and it’s symptoms can be reversible. You CAN make already weak bones stronger and denser with the right kinds of treatments, nutritional changes and exercises. Beth has Osteoporosis and her doctor has advised her to start strength training to help strengthen her bones. She’s curious exactly HOW this particular type of exercise works to increase bone strength and density. There are so many positive benefits about making strength training part of your regular routine that it would be downright foolish to not include it in your lifestyle in some way.